What is Digital Asset Management Software? | Lucidpress . ', failHtml: "
Lucidpress fills in the gaps of digital asset management (DAM) with a brand templating & design platform for teams who create lots of content. Digital Asset Management (DAM) software is a corporate marketing tool used to manage, share and organize digital files. This software helps companies manage their brand assets through storing, collaborative editing & sharing, and protecting their creative content. Employees can easily modify, compare and distribute documents, images, and many other digital media assets. But is a DAM system enough for your company? When it comes to brand management, DAM systems are incomplete. The features and capabilities of digital asset management software have expanded greatly over the past decade, and there are now several varieties of digital asset management software solutions. Modular: DAM systems that can be used alone or as part of a larger suite of tools for your marketing and content-creating purposes. This could include such elements as web content management, work and performance management, enterprise account services and collaboration. Integrated: DAM systems offered exclusively as an integration, usually part of a larger suite of content & marketing tools. These DAMs are not sold independently and are originally connected with other tools in the suite. Integrated DAM capabilities are often found in content marketing platforms, web content management, social marketing management and digital advertising platforms. Specialized: Software that is focused on a narrow group of features for your marketing flow. This can include marketing automation, channel distribution, brand management and media production. Content storage where users can create, edit, update and organize their digital assets. User-friendly organization & sorting technology that is often supplemented with AI to automate relevant content asset tags and metadata. Easy navigation of digital assets through intensive search engines within the product. Management of content rights and the life cycle of content marketing materials. Access permission restrictions and guidelines of what other users can or cannot do with digital assets. APIs and other integrations to incorporate your DAM system with larger marketing programs and business models. Personalizable portals to fit the needs of your organization’s account. Workflow management, such as idea management & planning, task management and content approval. These features are designed to keep the entire marketing team on track with projects and assignments. Analytics for the usage and effectiveness of any digital asset that’s created and shared. These features also give feedback on your team’s workflow, so you can consistently find ways to improve your team’s efficiency. Learn how Lucidpress' brand templating platform can improve your digital asset management stack. ✓ A secure place to store & manage your creative content and marketing resources. ✓ Improved digital content management to meet an ever-growing demand for clever, personalized content across channels in real-time and at a greater scale than ever before. ✓ Increased brand consistency as employees are given access to on-brand and up-to-date materials for your marketing efforts. Branded digital assets are kept updated within your media library as your organization grows into its identity and meets the needs of the market. Poor customer experience: Complex DAM systems can make it difficult for the users who are creating and editing content. Digital asset management tools can provide users with branded assets, but this doesn’t prevent users from downloading a logo and stretching or discoloring it. While DAM systems prevent some off-brand collateral from being created, there are still ways to misuse branded assets. Digital asset management solutions are typically created for generic use cases and are limited in industry specialization. Most organizations face industry-specific obstacles and challenges in their marketing efforts. Since many DAM softwares are made to meet broad audiences, they fail to assist users who are seeking marketing solutions for their industry. Define which features will be most useful to your organization and when your employees will begin using the DAM software. Talk to other members of your industry to hear their experiences with digital asset management tools. Seek advice regarding your asset management use cases with other industry leaders. Assess the top digital asset management platforms you’ve found through your research, and consider the specific features each offers that meets your preferences. Also consider the onboarding process, user experience, licensing, and how the software will fit within your marketing flow. What are digital assessment management tools missing? Without an integration with a preferred content creation tool, it’s easy for employees to download a digital asset and continue to use it without realizing there’s an updated version. Even if your design team provides brand guidelines or a brand manual, employees can easily go off-brand when creating new content with outdated digital assets. If your digital asset management software even has templates, you likely can’t lock down the content—so either everyone can alter it or no one can. ✓ Establish a brand, and maintain its consistency across all types of marketing collateral through user permissions and template locking. ✓ Design templates with the latest logos, taglines & color palettes, then lock down those elements so anyone using them will stay on-brand. ✓ Update brand digital assets for seamless integration and sharing across the company. This means no more outdated logos floating around for employees to find and use. ✓ Create newsletters, brochures, ebooks, social media ads and more using cloud-based software with real-time collaboration. ✓ Lucidpress’s intuitive interface will make creating professional content easy for all of your employees—designers and non-designers. ✓ Only have a small library of digital assets? Skip using a DAM altogether, and use Lucidpress’ brand asset manager to store all of your assets in one place. Google Drive offers a solution for creating, editing and sharing digital assets for companies & organizations. It’s a free SaaS that allows for simple sharing and collaboration between users. Integrate Google Drive with your Lucidpress account to easily share your content created in Lucidpress. Dropbox defines itself as a “cloud-based file sharing service” and has free accounts as well as paid enterprise accounts. Dropbox allows for users to upload, store, share, review and manage files—however, its editing abilities are limited. This is where Lucidpress fits in with Dropbox, as it’s easy to update your branded assets in Dropbox and pull them into your Lucidpress documents via our Dropbox integration. Brandfolder offers advanced DAM platform features not found in Google Drive and Dropbox such as using metadata and taxonomy management to tag and manage large volumes of digital assets at scale. 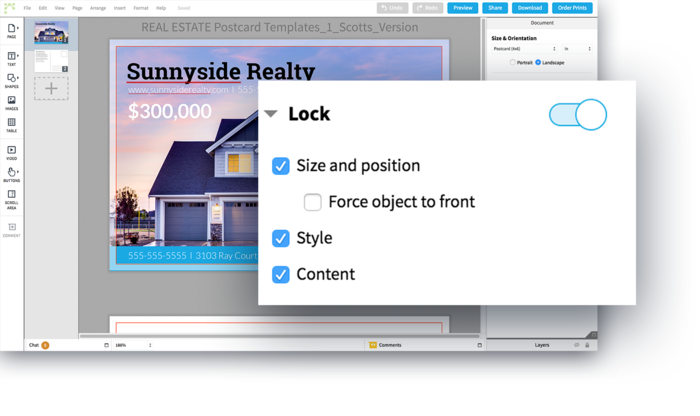 Combined with Lucidpress’ brand templating platform, teams can quickly find approved brand assets stored in Brandfolder's DAM and incorporate them into marketing collateral created in Lucidpress. Lucidpress offers simple, what-you-see-is-what-you-get design software that can be templated, locked down, shared, updated and published on any channel for your marketing efforts. By integrating Lucidpress with your DAM solutions, you can easily & quickly design on-brand content, then store and share those assets with your employees. Specialize your marketing toolbox by finding the right DAM system and adding Lucidpress to your suite. We specialize Lucidpress to your industry and role when you open a Business account. Marketing flow will become more efficient as your content creation & management gets more specific to your business. Request a demo to learn how Lucidpress can improve your digital asset management system. See the Lucidpress brand templating platform in action.